As such, even if you don't necessarily need any of the aforementioned items, it's probably a good idea to be prepared just in case. In case you do eventually manage to fill up your handset's 128GB, 512GB, or 1TB hoarding space or if you decide to purchase a more affordable 32GB model next and rely on the cloud and a blazing fast microSD card for anything exceeding that mark. 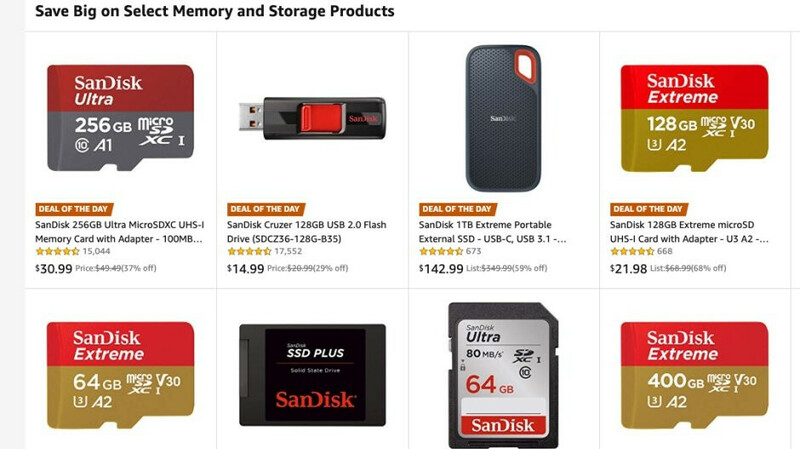 Just in case well-reviewed memory cards from reputable brands like SanDisk didn't feel inexpensive enough, Amazon is holding yet another big sale on a bunch of that stuff. A 256GB SanDisk Ultra microSDXC UHS-I card with up to 100 MB/s transfer read speeds, for instance, is available at an unprecedented discount of $18.50, representing a whopping 37 percent off its list price. If you need something faster that can handle higher-quality photos and 4K UHD videos, the SanDisk Extreme lineup is naturally costlier, although a trio of substantial discounts bring the 64, 128, and 400GB models down to new all-time low prices of their own. You're looking at savings of between $5 and $164 (!!! ), equating to list price reductions of up to 68 percent. Meanwhile, if you'd rather store or back up your content on a flash drive, two SanDisk iXpand variants designed specifically for iPhones and iPads and a 256GB Ultra Dual Drive for Android devices and computers are also on sale at up to 30 percent off. The Ultra Dual Drive comes with both microUSB and USB 3.0 connectors, promising to transfer files to a PC at up to a 150 MB/s speed. The iXpand (available in 128 and 256 gig capacities) boasts similarly impressive USB 3.0 numbers and a diminutive size, automatically backing up your photos and videos at plugin. A sale article without the actual sale link?? They've been doing it for months now. It's not so bad when it's something like BestBuy or B&H with clear product pages, but it's terrible with Amazon that might have 30 sellers with the item and only one of them is offering the deal. I don't know if it's particular writers, but that'd explain it. I've seen on Amazon these cards are counterfeit, many customers are mad about that. I bough a Samsung evo 128gb for $20 and a sandisk extreme 64gb for my camera for $16 last month Without a sale. These are somewhat standard prices.